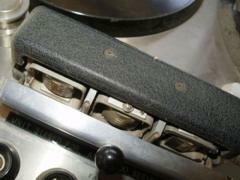 Portable tube machines, available mono or stereo. 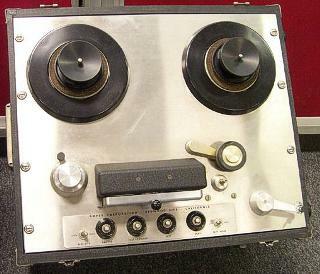 Used seven inch reels and operated at a single speed, either 3.75 or 7.5 ips (field convertible with kit available from Ampex). No tape lifters at all! Das war also der Anfang der Home-Versionen von Ampex. Das Band wurde auch zum Umspulen nicht von den Köpfen abgehoben. Damit war natürlich ein Verschleiß vorprogrammiert, der manchen das Fürchten lehrte. Aufgrund der vielen Trafos mussten diese Kisten (Koffer) noch richtig schwer gewesen sein. In manchen uralten schwarzweißen amerikanischen Jerry Cotton Krimis sehen Sie diese Bandgeräte noch bei der Polizei laufen. Es gab nichts Besseres. Rechts der Kopfträger mit Stereoköpfen und Mu-metall Abschirmung. 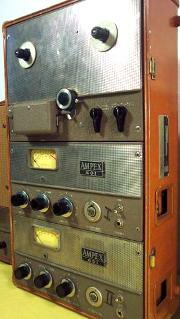 The worst Ampex, hands down, universally considered a catastrophe. Two motors, capstan to the left of the heads. The electronics are very similar to those of the 350. Die Serie 400 war dann die "preiswertere" Version der 300. Alles war abgeschminkt auf das unbedingt Notwendigste. Die Bilder der beiden Chassis sprechen Bände. Ganz genau, wie der Amerikaner sagt, Hände weg davon. Also der Capstan-Antrieb war rechts, wie die Fotos dokumentieren. Der Bedienhebel in Form einer Heuschrecke war schon lustig. Über den Rest können wir nichts mehr finden. A hit and, with the 351, the best of the "smaller" Ampexes. 350s had a four-pin Jones plug between the electronics and transport; the electronics had an outboard power supply and used point-to-point wiring and octal tubes. Some people think the 350 has more headroom than the 351 owing to an allegedly beefier bias oscillator. Two-track version available, but maybe not right from the start. (?) The direct capstan drive of the 350 series yielded greater absolute speed accuracy but more flutter than the 300 transport. Transport identical to 350 (or nearly so) except that it uses a six-pin Jones plug to connect the electronics and transport. 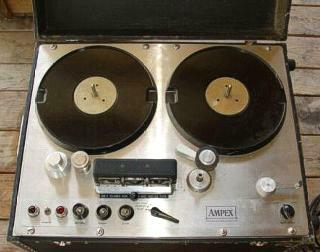 The first Ampex to be designed as either a stereo or mono machine from the beginning. The front panel of the electronics, of which there are several versions, is distinguishable from 350 electronics only by the black dot under the "input transfer" switch. Unlike the 350, the 351 electronics have an integral power supply, printed circuit boards, and use miniature tubes. With the 350, the nicest of the smaller tube Ampexes. The most desirable of the several versions of the electronics are P/N 02-30960. Same transport as 351. Electronics have two channels crammed into one chassis, small VU meters and knobs, and a less-than-wonderful tube complement. Hard to work on because of the cramped interior space, roblems with heat build up for same reason, switches aren't robust. Front panel bias and EQ adjustments. Available with the same three head configuration as the 350 and 351 or with a four head headblock, which allowed for a quarter track playback head. 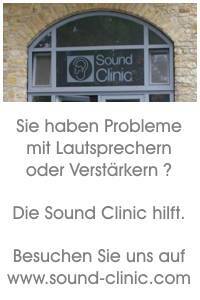 Sound isn't as good (in my opinion!) 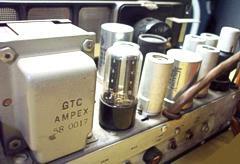 as the 350 or 351, but still better than most transistor (including non-Ampex) machines. Microphone preamps plugged in to octal tube sockets and usually are not present. 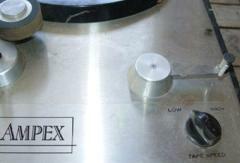 The first transistor Ampex. Transport design essentially unchanged from the 350/351/354. Faceplate and control panel redesigned to conform to the "new" corporate look of the MR-70 and later AG-440. Eight conductor Jones plug interconnecting the transport and electronics. Speed change on the transport now changes EQ automatically. Available with either the three or four head headstack, like the 354. 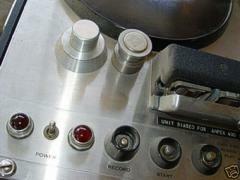 Locking level controls for record and reproduce, as on the MR-70. 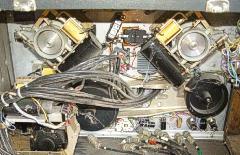 Ampex offered a kit to upgrade tube 350 series machines to use AG-350 electronics. No built-in microphone preamps. Facelifted 300 transport, as for AG-350, with AG-350 electronics. No built-in microphone preamps.